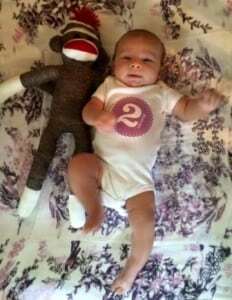 Dexter Ian is two months old today. The big news is that he smiles socially, which is like a little piece of magic every day. I couldn’t make it happen for this photo but I’ll link a video of a smile. Dexter’s current favorite things are resisting naps, kicking his chubby legs (hence the blurry photo), growing so fast he only gets to wear adorable outfits one freaking time, and his mommy. I don’t want to brag but this kid is obsessed with me. The fixation is new, in the past couple of days, but Dex cries if I’m out of his sight and yesterday he stared steadily at me through an entire trip through Trader Joe’s like a tiny little creeper. I’m sure it has nothing to do with me being his walking, talking milk machine and is predicated entirely on my bountiful charm. Oh, I almost forgot a favorite thing – Matt has been back at work for the past month and Dex is a big fan of tickly beard kisses from Daddy when he gets home every night.